Last Wednesday I wrote about “Shaping the Chaos”—beginning (again) to work on my personal/spiritual memoir, Jesus Freaks, Belly Dancers and Nuns. As I said in my previous post, I’ve written a couple of versions of this memoir in the past—most recently in 2010. I see myself as a personal essayist more than a memoirist. I know that distinction may seem negligible, but it’s important to my work life and the way I go about conceiving projects. To me, a personal essay is a piece in which I use my own experiences as a lens to look at larger, more universal issues and phenomena. It’s just an essay, not an entire book. It’s just an essay, not an entire book. I guess it’s the journalist in me, but when working in the first person I like the idea of writing a set of discrete pieces rather than a whole book. It’s just more manageable for me. My last collection of essays, The Unspeakable, was composed entirely of essays that hadn’t been published elsewhere before. The pieces were written for that book and meant to be in the company of one another. Some people asked me why I didn’t just write a straight-through book addressing the ideas that run through the essays…. Ultimately it seemed right to do them as individual pieces. They each have their own unique arc and structure and tone, which is intended to take the focus away from Meghan, the narrator, and direct it toward something broader and more interesting. Thank you, Meghan Daum. I was feeling this way about my memoir, but wondering if I was just being lazy. And maybe that’s part of it, but I resonate strongly with Ms. Daum’s reasoning here. And so I press on with this format. I never decided to write a memoir…. Once I started working on it, I looked back at my previously published work and realized that not only was this all of a piece, but that the various pieces, along with the new material I was generating, constituted a memoir. I hope that my materials also constitute a memoir. Stay tuned. And thanks, always, for reading. P.S. For those following my progress with Cherry Bomb (my novel) and Tangles and Plaques (essay collection)… I’m no slacker. I’ve sent out 25 agent queries for Cherry Bomb and 18 press queries for Tangles and Plaques in the past few weeks. 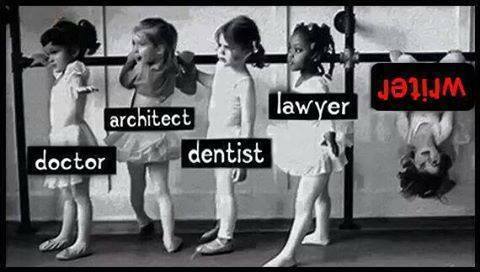 Have only received a couple of rejections (two for Cherry Bomb and one for Tangles and Plaques) and so the journey continues…. 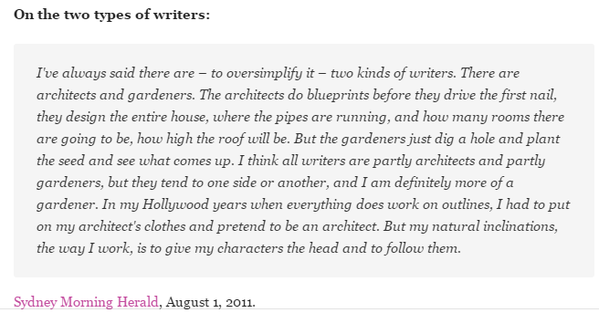 Oh and for those who follow the logic that there are two types of writers… I’m definitely an architect, not a gardener.